Jami Marseilles was stranded in a blizzard while attempting to drive home from a ski trip in New Mexico. Stuck on a solitary back road in Arizona, Jami and her friend survived ten days before a man and his son found them by chance on their snow mobiles. At the brink of death, Jami’s only option for survival was the amputation of her frostbitten legs. Jami spent the next several years gradually improving her health, spending countless hours at the gym and learning to walk on her prosthetics. After watching the 1996 Paralympic Games for the first time, Jami decided she wanted to run. 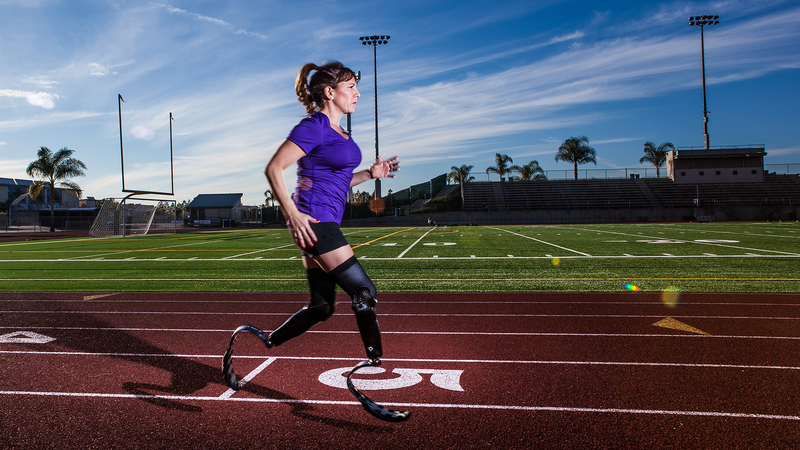 Jami began to train and compete with proper running prosthetics, which eventually culminated into a successful finish at the 2015 Chicago Marathon; this made Jami the first female double amputee to do so. In 2016, she became the first female double amputee to complete the Boston Marathon. Today, Jami teaches children in the Garden Grove School District in Orange County, CA. She is married to her longtime sweetheart, Beau, and is the mother of two beautiful children. She has worked as an ambassador with Challenged Athletes Foundation for the past 15 years and as a camp counselor for the Dream Street Foundation. Jami hopes to inspire those she meets by being a living example that loss doesn’t impede on happiness and a productive life.